“Rapture! Victorious! Glorious! 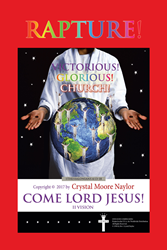 Church!” from Christian Faith Publishing author Crystal Moore Naylor is an informative work that teaches readers how to minister to other people who are in need with the Lord’s power and how to claim victory over every life aspect and circumstance. “Rapture! Victorious! Glorious! Church!”: an impactful book that contains truths about salvation, healing, miracles, and deliverances, among others. “Rapture! Victorious! Glorious! Church!” is the creation of published author, Crystal Moore Naylor, an anointed Christian minister, artist, author, poet, playwright, and song writer. Published by Christian Faith Publishing, Crystal Moore Naylor’s new book is an absorbing work that informs everyone about the biblical truth that Jesus Christ has died on the cross so that every sinner will be saved and have eternal life as well as the ways on how one can live a victorious life with the Lord. The power of the Lord to heal and transform people’s hearts is stressed in this book. Readers will be blessed and encouraged as they read along. View a synopsis of “Rapture! Victorious! Glorious! Church!” on YouTube. Consumers can purchase “Rapture! Victorious! Glorious! Church!” at traditional brick & mortar bookstores, or online at Amazon.com, Apple iTunes store, or Barnes and Noble. For additional information or inquiries about “Rapture! Victorious! Glorious! Church!”, contact the Christian Faith Publishing media department at 866-554-0919.